If you really need to control applications on your smartphone or tablet whilst engaging other activities, so a new gesture-control device called the Bixi – now raising funds on the Kickstarter – could help. 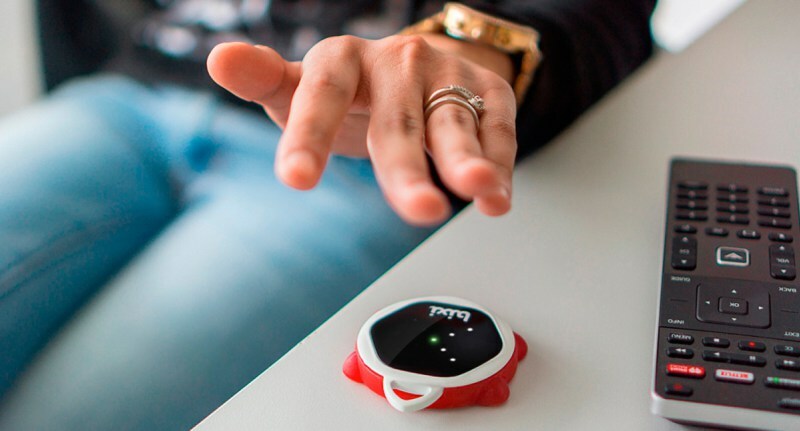 Bixi is a new piece of hardware which allows you to control your mobile devices by just simply waving your hand to access applications, pause media, turn pages and more. The Bixi itself comprises a 2.6 x 2.3-in portable optical sensor, along with a plastic casing, a silicone body and a scratch-proof Gorilla Glass 4. It can be hung from, stuck on or otherwise attached to things, and moved around freely and left on a table or shelf as required. It’s not just for on-screen tasks, either, since Bixi can be used to interact with plenty of smart home apps via your smartphone. For instance, raising and lowering your hand can alter brightness of your Hue bulbs while swiping left and right changes the song on Spotify. The Bixi can interact with a whole host of name-brand tech, including Apple TV, Nest, Sonos and can even control PowerPoint presentations. Currently, up to eight different gestures can be detected, at a distance of up to 10 in and within a 35-degree field of view. Those gestures include clockwise or counterclockwise motions, air taps and swipes in different directions. The device connects to a user’s smartphone via Bluetooth and the Bixi app relays instructions to paired devices and services via Wi-Fi. The Bixi is charged via a micro-usb port and the battery will apparently last for around a month from just a single full charge of one to two hours. If Bixi’s gesture controlled lifestyle sounds like your cup of tea, a Kickstarter crowdfunding campaign for the Bixi is under way. At the time of the writing pledges from US$69 will be rewarded with one of the Bixi, assuming all goes to plan with the roll-out. Shipping is expected from March this year.